This pack contains three of our most popular items. A lovely jingle bell wristband a ribbon on a sparkly stick and a sheer scarf. The ultimate for keen little dancers. A castanet will also be included for some extra dancing fun. 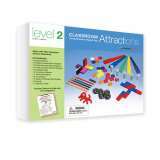 The Early Accelerator Set 2 by Junior Learning is a great tool that aids in a child's development. Each card is pre-reading (without written words). The cards cover topics including things that go together, patterns, animals, colours, matching and habitats. Brainbox create a great range of electronic kits with easy to use press-stud system for putting together the various circuits. No wires, soldering or trimming requiredThe kit uses simple brightly coloured components with press-stud connectors. Colourful wall chart (2-sided) that illustrates numbers from 1 to 20 using Australian native animals. Counting Kangroos is fun! The opposite side illustrates numbers from 1 to 100. Display one side for a month or two, then flip and display the opposite side. Printed on durable, gloss-coated card.